During a radio interview Tuesday, Sen. Mark Kirk announced he would write in former Secretary of State Colin Powell for president, instead of voting for Republican nominee Donald Trump. The announcement comes days after his opponent, Rep. Tammy Duckworth, released a campaign video slamming Kirk for previously endorsing embattled former CIA Director and retired U.S. Army General David Petraeus for president. During the interview with WJBC Tuesday, Kirk explained that he changed course because Powell is “much more experienced at the national level.” Powell, a retired four-star general, served as Secretary of State during George W. Bush’s first term as president. However, Kirk conceded that a vote for Powell, or Petraeus, wouldn’t count because write-in candidates are required to register with the state. "It wouldn’t count, yeah," Kirk said. "It's just kind of a protest vote for me and I think that Donald Trump is too bigoted and too racist for the Land of Lincoln." The Democratic Party of Illinois responded to Kirk’s endorsement of Powell Wednesday, faulting the senator for changing his pick. 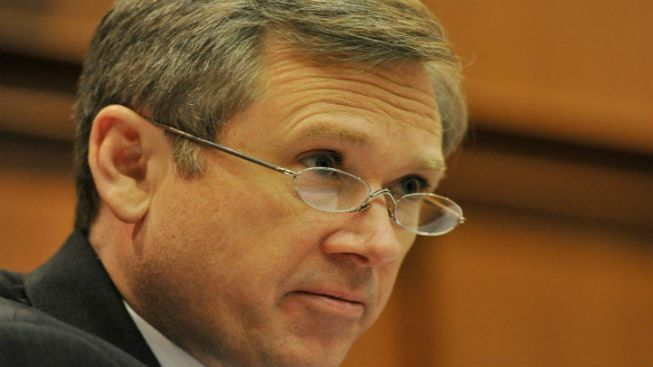 "Choosing a president is a serious business, and Republican Mark Kirk has shown for the third time in six weeks he’s not serious," DPI spokesperson Sean Savett said in a statement. "Kirk’s presidential picks keep changing but his willingness to shift positions - whether owing to political pressure or lack of conviction - stays the same." In March, Kirk told NBC Chicago he would support Trump if he were the Republican presidential nominee. Then in May, Kirk told USA Today that he would be willing to serve as a national security adviser to Trump. Kirk ultimately pulled his tacit endorsement of Trump last month after Trump made a series of inflammatory statements about the heritage of a Hispanic judge presiding over civil fraud lawsuits against his beleaguered Trump University. After Kirk made it clear that he would no longer support Trump, his campaign announced that he would back either Petraeus or Powell. Earlier this month, Kirk said he would write in Petraeus during an interview with Steve Cochran before changing course this week. Meanwhile, the senator released a campaign video Wednesday, tying Duckworth to imprisoned former Gov. Rod Blagojevich. Kirk’s campaign has repeatedly tried to link the congresswoman to Blagojevich, who appointed her director of the IDVA in 2006. The video outlines the former governor’s history of political corruption through a series of news clips. Blagojevich was found guilty of soliciting bribes for political appointments in 2011. Most notably, Blagojevich actively solicited bribes for President Barack Obama’s vacant US Senate seat after he was elected president in 2008. The spot also features a clip of Duckworth commending Blagojevich’s accessibility and dedication to the armed forces. "After the US Attorney’s office announced Gov. Blagojevich was under investigation for hiring fraud Duckworth said she would still support his run for re-election," the video’s final title card reads. Kirk’s campaign is not planning an ad buy around the video, which mirrors the format of Duckworth’s campaign spot from earlier this week. That video slammed Kirk’s “bizarre presidential ticket” of Petraeus and vice presidential candidate and Indiana Gov. Mike Pence. The Duckworth campaign scoffed at Kirk's new video Wednesday afternoon. "This video is a hot mess, and unsurprisingly for someone who has lied about his military record 10 times as Mark Kirk has, totally dishonest," Duckworth campaign spokesman Matt McGrath said in a statement. "What's true is that Tammy Duckworth served 23 years in the Army National Guard and Army Reserve, and has dedicated her life to serving veterans, with real results." "Kirk, meanwhile, has lied about being shot at in combat, lied about receiving military awards he didn't earn, and voted against the most comprehensive veterans' benefits bill in recent history," McGrath added.